Rice payasam is a delicacy, usually reserved for special occasions such as Tamil New Year or Krishna Jayanthi. It takes longer time to prepare, but has the wonderful taste of milk cream. Some call this recipe 'Milk or Paal payasam" (பால் பாயசம்). Just try this out for your next special day. *You may use ¾ tumbler (150ml measure) jaggery (வெல்லம்) instead of sugar. Method: Remove cardamom seeds and powder them using the mortar and pestle. Heat 1 teaspoon of ghee in a kadai, add broken rice and moong dhal and fry till the dhal turns light brown in color. Add 1 tumbler (200ml) of water, cardamom powder and clove. Once the contents start to boil, reduce the heat. Cover and cook on low flame till the rice and dhal become very soft (நன்கு கரைய விடவும்)*. Once the water is fully absorbed and rice is cooked well, add milk and bring it to boil. Reduce the fire and cook on low flame stirring continuously till the milk quantity is reduced to half the volume. Now add sugar/ jaggery, and mix well. Simmer for 5 minutes stirring every now and then. Remove from the fire. Heat the remaining ghee in a tadka pan/spice pan (தாளிக்கிற கரண்டி), add cashew nuts and raisins and fry till the nuts turn light brown. Switch off the fire. Add the fried items to the payasam. Serve hot. *It generally takes long time for broken rice to cook well. Add more water if required and continue to cook till the desired consistency is reached. Alternatively you may pressure cook the broken rice and dhal with ¾ tumbler (150ml) of water for 5 minutes or 5 whistles. 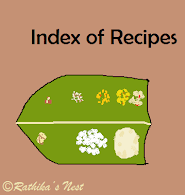 You may cook such small quantities along with rice or dhal cooked for regular meal. Note: Use full cream milk for best results. Alternatively, you may add 2 teaspoons of condensed milk (Milk Maid) to the payasam in the end. Mix well, boil for a minute and switch off the fire. This adds to the richness and taste of the payasam.